The Rotastak Space Command Unit provides a complete living environment for your Hamster, Gerbil or Mouse. The wide variety of rotastak tubes, tunnels, extension units & accessories allow you to build a rotastak hamster cage, that helps to stimulate their natural living conditions and provide them with hours of fun and entertainment. Rotastak allows you to build a complete and extendable world for your hamster, gerbil or mouse, by joining together the various homes, extensions and accessories in any combination you choose, the system can grow with your imagination. 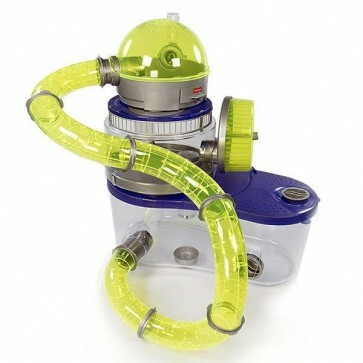 The Rotastak Space Command Unit shown above is a Huge Self Contained Housing Unit which includes; a Curvy Tunnel, Dining Room, Maxi Unit, Original Round Unit, Water Bottle (75mm), Rainbow Runner, 3 Feeding Bowl, Anti-Gnaw Rings & Glow In The Dark Yellow Plastic for that Space Exploration Effect!